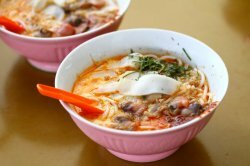 Sungei Road Laksa may serve up one of the simplest bowls of laksa, without modern adornments like eggs, prawns or otah, but what they lack in frills, they compensate with freshness and quality. 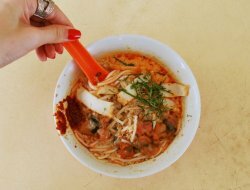 The illustrious heritage hawker still uses charcoal to fire up his stove, and if you ever thought it was no biggie to use charcoal fire, Sungei Road Laksa will change your mind; it's immediately evident that the smoky char of the fire imbues each bowl of laksa with an irresistibly heady aroma. The standard order Laksa ($3) is loaded with beansprouts, fishcake and cockles. The cockles, though petite, are swimmingly fresh and succulent, and lend a briny accent to the rich and robust gravy. If you can take the heat, ask for extra helpings of the sambal chilli to stir into the gravy, it adds a potent punch and complements the laksa base. You can laksa in many ways, but this is the charcoal-powered way. Power lah. 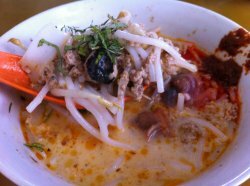 Laksa is a very specific local food: spicy, lemak-coconut rich, piquant, fiery delicious slurping soup with smooth noodles. It's not an everyday thing to develop a craving for, until you catch a whiff of charcoal-powered laksa. 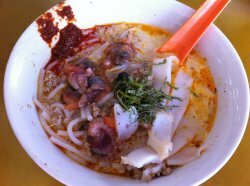 It is everywhere in the atmosphere around Sungei Road Laksa, and practically an aroma appetizer - if there is ever such a thing. This is my one of the stops with Roy on our noodle trail and the awesome fragrance in the air just perks us up immediately. Am I late to the game for trying out Sungei Road Laksa only after twenty-two years of existence on this island? I can only say that this definitely goes into the list of food that I hold dear to my heart (and my brain will occasionally conjure it up in the depths of the night). Rather than a city that never sleeps, Singapore is a city that never stops eating. Really, there are people eating everywhere regardless of the time of the day. 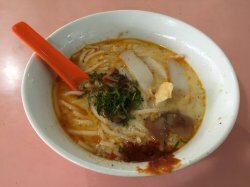 That's probably why even at two in the afternoon, the folks at Sungei Road Laksa are still super busy with their duties at the stall - replenishing the charcoal, scooping out delicious laksa into their iconic pink bowls. Sharp eyes or regulars would notice they've upped their pricing from $2 to $3 a bowl. No chopsticks, just spoons. Like 368 Katong Laksa's, they've chopped up the noodles to make it easier to eat... which is really a smart way to do it because I definitely cannot resist slowing down on this one! 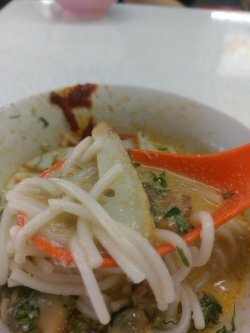 This bowl from Sungei Road Laksa has got a creamy coconut base, chock full of cockles, shrimps, and fishcake, making it really lavish with the taste of the oceans. Mouthwatering just to think about it... the spiciness level is not overpowering but remains apparent, very manageable and enjoyable. 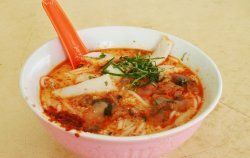 It is a good representative of what laksa should be. 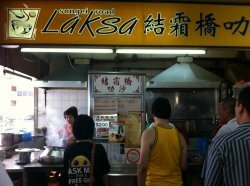 Old school laksa only for $2! 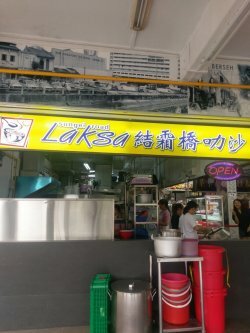 Sungei Road Laksa is a humble stall in a coffee shop. There is a long queue when we got there. The stall is manned by 3 ladies when we went on a Sunday morning. One of them was busy filling the bowls with ingredients, another one was busy taking orders while the aunty was filling each bowl of laksa with the gorgeous broth, fueled by a charcoal burner which I believe to be one of the last few existing stall which is still using charcoal. And, THEIR LAKSA IS ONLY $2! Here, you don’t get very heavy laksa gravy. It was light, easy to drink but it was a flavourful bowl. You can smell the spices in the gravy, sweet yet mild spicy, infused with coconut flavours and hae-bi in it! And the crunchy bean sprouts added texture to the bowl of laksa. One $2 bowl may not be enough for guys, but it was a perfect size for me. I was slurping up till the very last sip. Ever heard the saying that all good things are cheap? No? Well, it certainly seems to ring true for this bowl of Laksa. 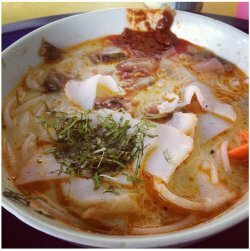 Hidden in a small coffee shop along Jalan Besar, it's such an unassuming coffee shop that you wouldn't think that there is a hidden Laksa treasure here. The place is quite hot like most typical coffee shop but for good food, just gotta bear with it! 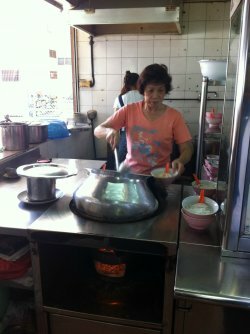 The Laksa was prepared by this sweet lady manning the pot. She was meticulously soaking and draining the noodles several time with the Laksa broth before finally scooping a final bowl of the soup into the bowl to serve. I think she's cooking the raw noodles with the heat of the Laksa broth and by doing so she instills more flavour than you would get if you cook the noodles with hot water. 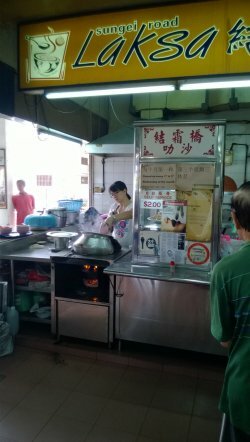 This is one of the few places they still use Charcoal to cook their Laksa. Don't stand too near, it's really hot! Food cooked the traditional method always seem better for whatever reason. Perhaps we appreciate the extra efforts it take. There is a long queue when we got there. At $2 a bowl, it's such a steal! How many place can you get a bowl of piping hot delicious Laksa (with cockles!) at $2!! It may not be a huge bowl but enough to fill you up! The Laksa looks so sedap! And the unique thing is you only need a spoon to eat it because they have cut the noodles into bite size so there's no need for chopsticks. Good idea right? And look at that generous handful of cockles. Mix the chili in and you've got a wonderful bowl of Laksa! The soup is spicy, thick and you can taste all the bits of hebi (dried shrimps) in it! The coconut taste is not too strong which is nice! A little bit oily but man, I was slurping up every last mouthful of it. The noodles were cooked well, slightly al dante, and soaks up all that spicy goodness of that broth. Shiok! Here's another shot where you can see that the noodles have been snipped to bite size portion. Rejoice lazy people rejoice!